Quality cash register counter at a budget price. Combine wrap counters with entire line of fully modular showcases for retail for complete service counters to fit your store`s needs. 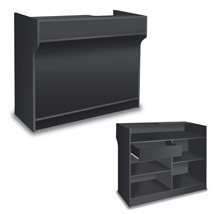 The Ledgetop Cash Register Counters has 22" D recessed ledge to hold a standard register. Inner countertop features cable holes for PCs and POS devices. Inside of the counter are shelves and a drawer for storage. Ships assembled. For additional options, we ask you to take the occasion to peruse our thorough inventory of showcases for retail at Specialty Store Services now. Please allow 2-4 business days lead time for this unit to ship assembled.